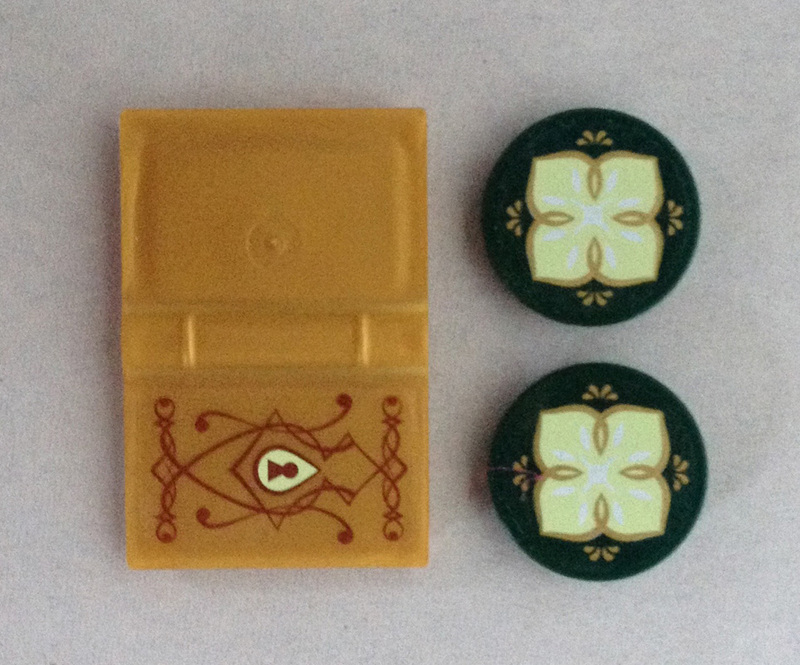 Notably, unlike several other Elves sets, this set does not include stickers, instead opting for four printed parts. And two of those parts are exclusive to this set! Firstly, a Bright Reddish Violet [TLG]/Magenta [BL] 2x4 tile with a printed scroll pattern (Element ID 6106079 | Design ID 20432) depicts a castle on a mountaintop far above the clouds, likely meant to depict the set 41078 Skyra’s Mysterious Sky Castle. 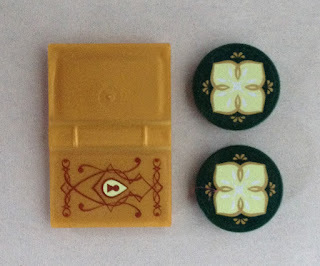 Secondly, the set features a new White 1x4 tile with ornate ruler printing (Element ID 6106728 | Design ID 20307). 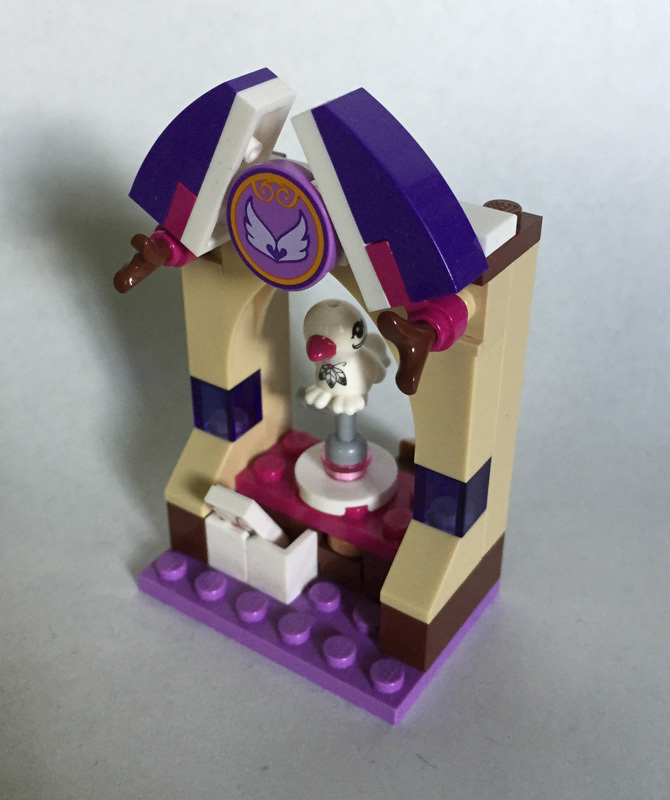 Both of these parts appear only in this set. 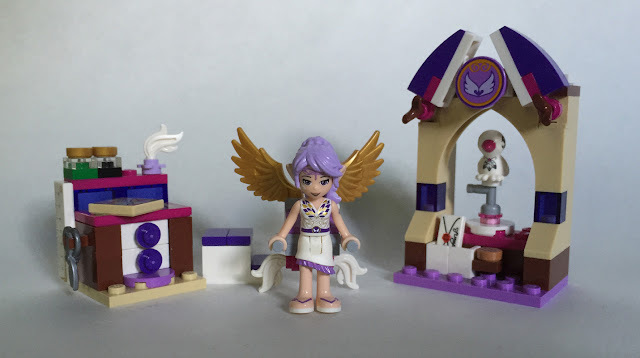 The set also includes a Medium Lavender 2x2 round tile with a printed wing pattern representing the element of air (Element ID 6104415 | Design ID 20300), which also appears in both of the summer Elves sets. And finally, the set includes the Brick Yellow [TLG]/Tan [BL] 2x2 tile with Elves map printing (Element ID 6104425 | Design ID 20306), previously discussed in three of the other Elves reviews. At this point you’re probably detecting a trend. The Elves map element appears in all but one of the current Elves sets, and its appearance in this set is the most incongruous—while the TV special features the map being obtained in the spa (the other subject of this review) and being used to obtain the four keys (accounting for its other three appearances so far), the Creative Workshop does not appear in the initial episode and there’s no discernable reason why the map would be seen there. It’s a minor complaint, and I appreciate TLG trying to get as much use out of this printed element as possible, but I have no idea what to do with all of these identical maps at this point, and it kind of makes me miss the days of Adventurers when multiple map designs were spread across the full range of sets. This set includes one Medium Lavender 4x6 plate (Element ID 6097343 | Design ID 3032), which is currently exclusive in that color. It also includes one Bright Reddish Violet 2x4 plate (Element ID 6037658 | Design ID 3020), which is new for 2015 and only appears in this and three other sets. The two Trans. Bright Bluish Violet [TLG]/Trans-Purple [BL] 1x2 bricks without pin (Element ID 6035495 | Design ID 3065) also only appear in three other sets. And in Warm Gold [TLG]/Pearl Gold [BL], the set introduces two minifigure wing elements (Element ID 6097514 | Design ID 11100), which only appear in this set and 41077 Aira’s Pegasus Sleigh. 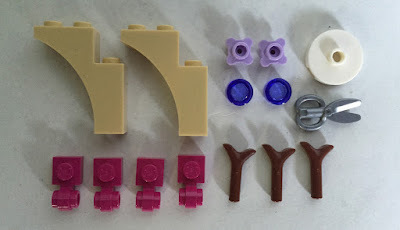 Noteworthy parts which have been discussed in earlier reviews include two Brick Yellow 1x3x3 half-arches (Element ID 6058093 | Design ID 13965), four Bright Reddish Violet 1x1 “lamp holders” (Element ID 6037651 | Design ID 4081), two Lavender 1x1 flower studs (Element ID 6074906 | Design ID 33291), three Reddish Brown carrot tops (Element ID 6078605 | Design ID 33183), two Trans. 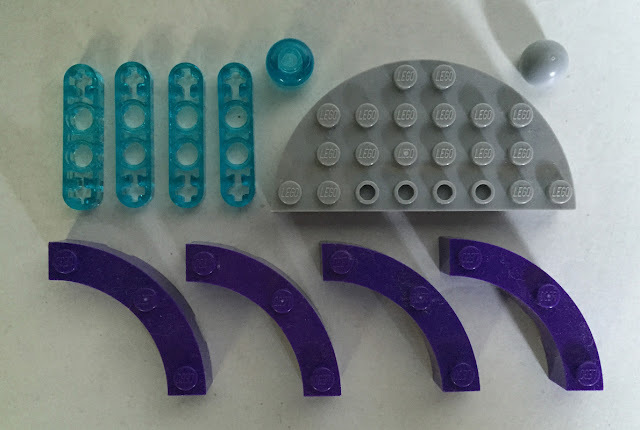 Bright Bluish Violet 1x1 round tiles (Element ID 6065505 | Design ID 98138), one White 2x2 round jumper plate (Element ID 6093053 | Design ID 18674), and one Silver Metallic [TLG]/Flat Silver [BL] minifigure scissors piece (Element ID 6096993 | Design ID 18920). Since this is such a small set, I’ll move straight to impressions of the set itself. The only mini-doll in this set is Aira the Wind Elf, previously discussed in the review of 41073 Naida’s Epic Adventure Ship. 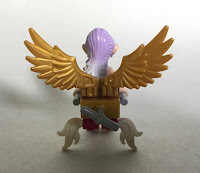 However, this set also contains a “wing pack” she invented to help her get from place to place. It’s not complex, but it does effectively convey the idea of motion, with gold wings, a propeller, and white feathers that look almost like they’re fluttering in the breeze. In a set with normal minifigures, a contraption like this would probably be secured to them with a neck bracket, but because no such part exists for mini-dolls, Aira attaches solely by the “handles” on either side. 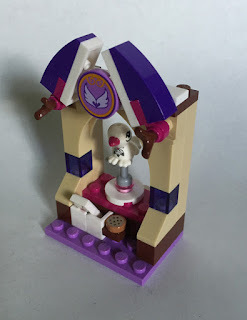 This is also the only set to include Aira’s avian companion, Pluma, whom she tasks with delivering short messages, or “tweets,” between her and her friends. 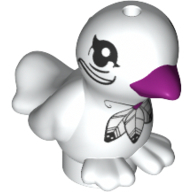 Pluma uses the same mold as the parrots and canaries in LEGO Friends, but this time in white, with a somewhat tribal-looking feather necklace and black markings under her eyes. She’s not the most impressive of the animals in the Elves theme, but she’s well integrated into this set, for reasons I’ll explain shortly. The first part of the workshop to be constructed is a small workbench. 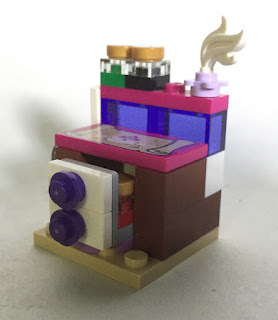 The scissors and ruler are attached to the side, the scroll tile forms the surface of the table, and a quill and two vials of ink go on a small raised shelf. The most noteworthy thing about this bench, though, is the functional drawer in the front. Despite having the appearance of two drawers, it pulls out as a single unit—probably to allow space for the height of the third inkbottle stored inside. The other section of the workshop is a window with a perch for Pluma. Despite the lack of enclosing walls, the window enough is enough to add a bit of architectural charm to the workshop. Below Pluma’s perch is a small basket that she can deposit letters into, and beside that is a secret compartment containing a cookie—probably a reward for her after a successful delivery. 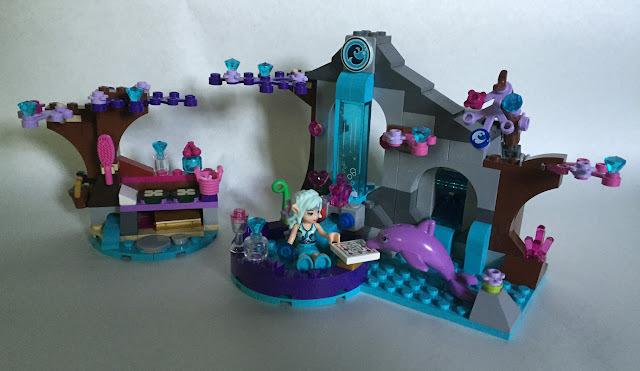 For such a small set, Aira’s Creative Workshop is a decent little model with plenty of role-play potential. And like the other larger Elves sets, it has a fantastic parts selection—including a plethora of printed parts. I can highly recommend this set to people who would like a taste of what the Elves theme has to offer! Brand-new for 2015, this set includes three five-petal floral hair accessories (Element ID 6096990 | Design ID 18853) in Light Purple [TLG]/Bright Pink [BL]. 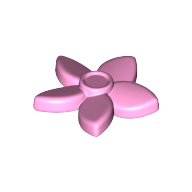 This particular flower design was likely introduced due to older floral hair accessories only appearing in a much larger pre-pack. 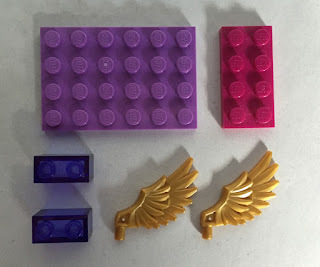 Pre-packs like that can serve as an easy way for TLG to mold a large number of distinct parts cheaply, by having multiple similarly-colored and related parts produced from the same mold (like in the case of Friends accessories or LEGO City power tools). The drawback is that small sets like this rarely need the full range of accessories that those packs include. The four Trans. 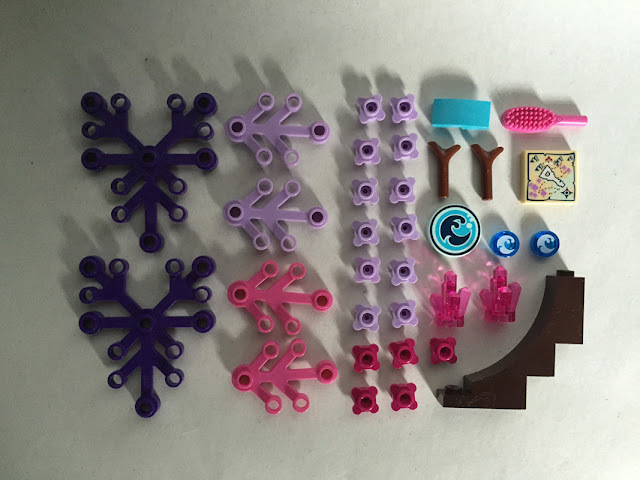 Light Blue 4M Technic half-beams (Element ID 6102824 | Design ID 32449) and the four Medium Lilac [TLG]/Dark Purple [BL] 4x4 bow bricks (Element ID 6097443 | Design ID 48092) are new and exclusive to this set. Not new but rare is the single Trans. Light Blue minifigure head (Element ID 6066376 | Design ID 30011)—only 41054 Rapunzel’s Creativity Tower had previously included the current “recessed stud” version of this part, while the previous “blocked open stud” version had only appeared in three pre-2004 sets. 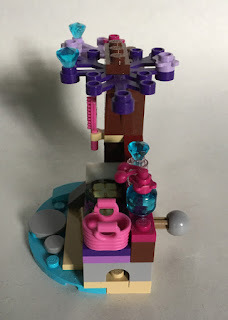 Similarly, the Medium Stone Grey [TLG]/Light Bluish Gray [BL] 4x8 semicircle brick (Element ID 4632356 | Design ID 47974) only appears in five sets, and the similarly colored “Voodoo Ball”/Bionicle ball joint (Element ID 6070731 | Design ID 32474) has only appeared in six. 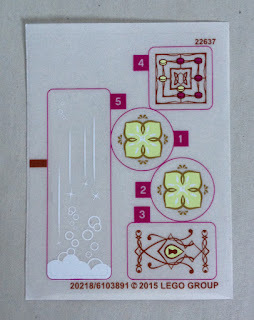 The set features one sticker sheet, and three of the elements that the stickers are designed to go on are new or rare. 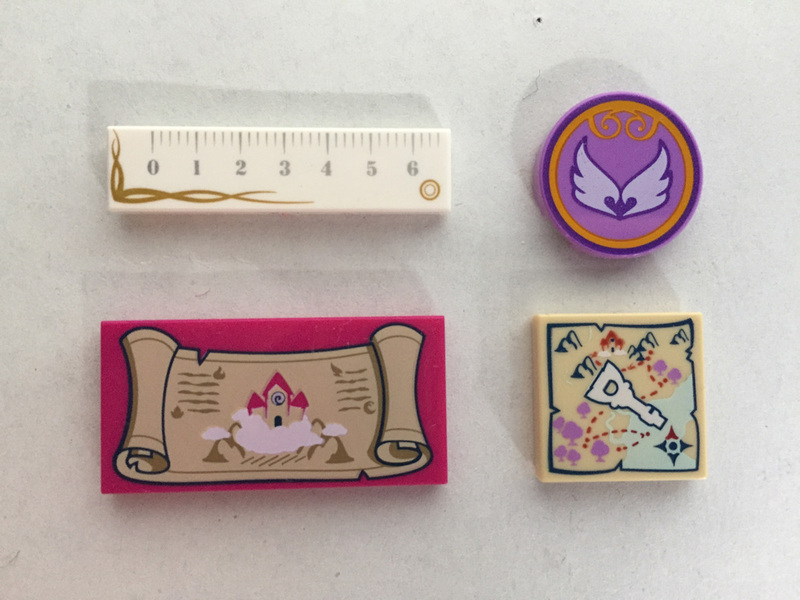 Like in my previous review of 41074 Azari and the Magical Bakery, I will be applying the stickers, but I have provided pictures of the parts in question both before and after stickering — it’s your decision whether you value the parts more stickered or left bare. 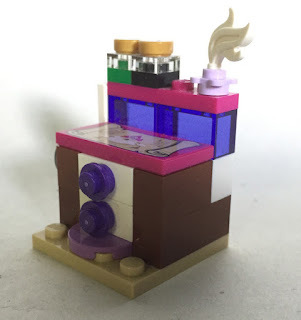 The first, and most noteworthy, is a Warm Gold book (Element ID 6102825 | Design ID 33009), which is new in this color and only appears in this set and two significantly more expensive Ninjago sets. The sticker on this part adds ornate detailing and a lock, identifying this book as a private diary of some sort. 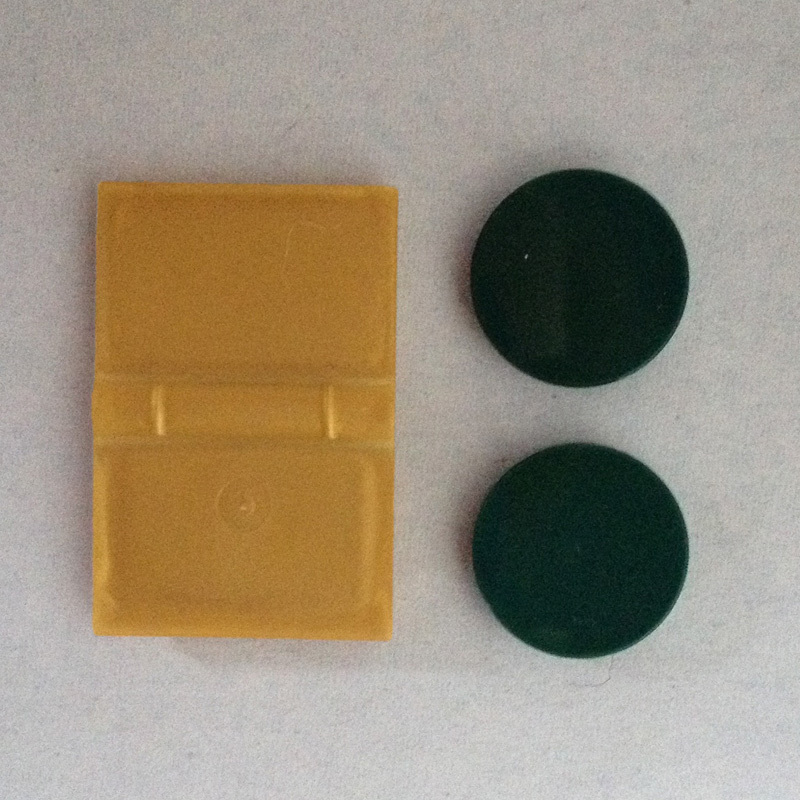 The other two rare parts to be stickered are two Earth Green [TLG]/Dark Green [BL] 2x2 round tiles, which like the ones in 41075 The Elves’ Treetop Hideaway are meant to represent cushions. The cushions in this set are a different design, with more of a flower or lily pad motif—fitting for the water-themed spa. The final stickered parts, representing a game board and waterfall, have not been photographed due to the parts they’re used on being neither new nor particularly rare. 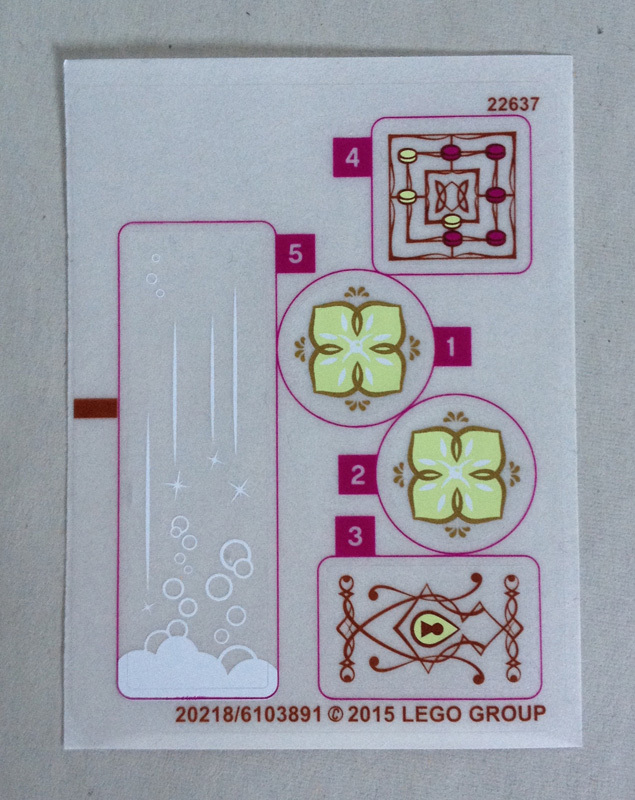 It’s worth noting, though, that like all transparent stickers, and especially those being applied to transparent parts, you should be extra-careful applying the waterfall sticker—while I like the look that sticker gives to this set, I did not do as good a job applying the sticker as I would have liked, resulting in a slightly smeared appearance. one Brick Yellow 2x2 tile with Elves map printing. 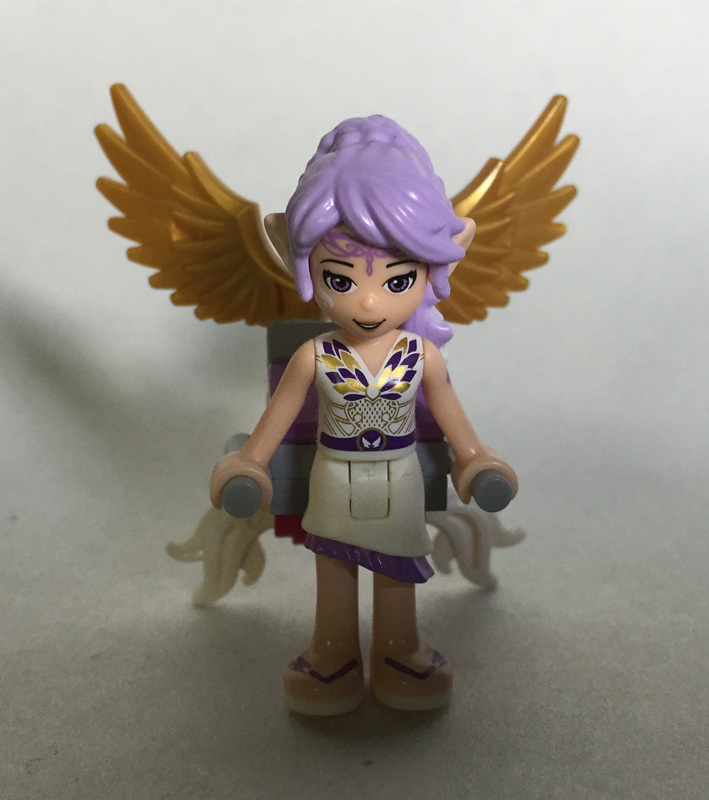 The only Mini-doll in this set is Naida, who is identical to her appearance in 41073 Naida’s Spa Secret save for the aforementioned flower element being added to her hair. 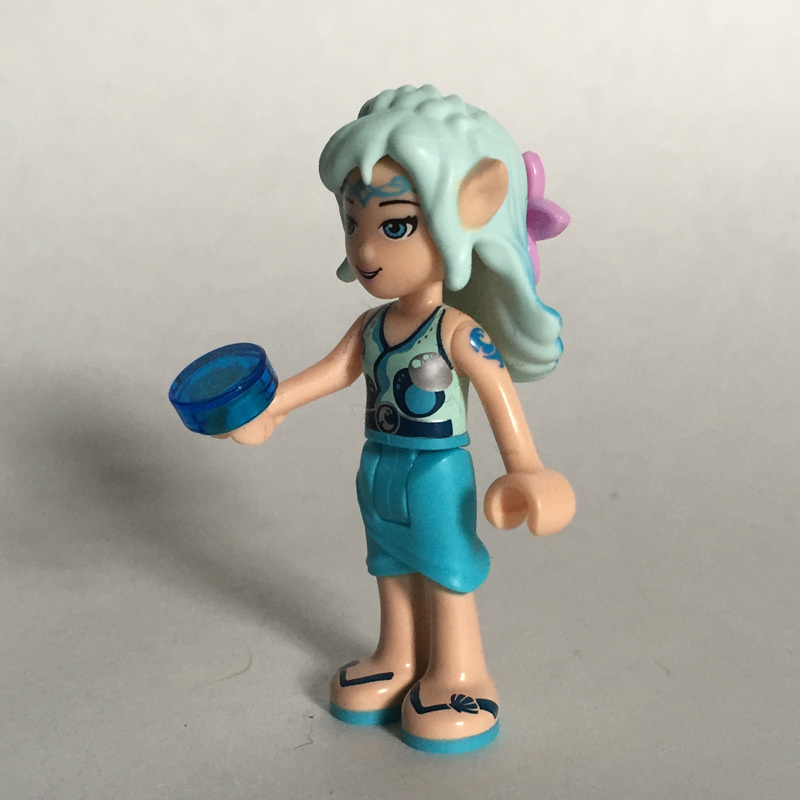 But this set is the only set containing Naida’s dolphin friend, Delphia. 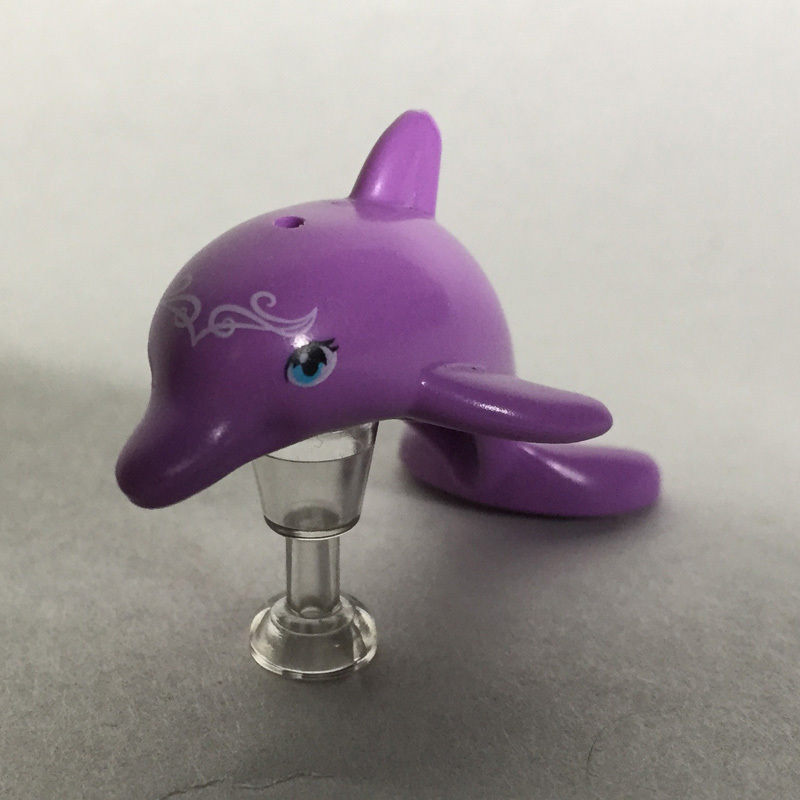 Delphia’s Medium Lavender skin and the ornate patterns on her forehead ensure that she stands out from past dolphins in the LEGO Friends theme. The first part of this set is a small day bed underneath a tree. Stepping-stones, a small rivulet, and cushions that look like lily pads all help integrate this creature comfort with the surrounding environment. A hairbrush and bucket hang from clips on the tree, bottles (presumably containing oils or perfumes of some sort) dot the rear wall, and at the end of the bed is a basket containing flower petals. Finally, under the day bed is space for the gold diary—a switch on the back of this segment can be pressed in to push the diary out without having to tilt the set to remove it. The other section of the set is a large spa area, with a small pool or bath for Naida and a larger section of open water for Delphia. The spa bath is cute and features hot and cold taps fed by a large waterfall. 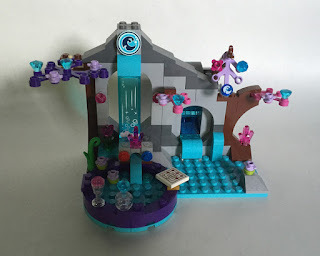 The larger open-water section includes the set’s main action feature—the map tile can be stored in a slot in the back of the rocky cave wall, and when the branch in the upper right is pulled, the map slides out of the waterfall in the front. 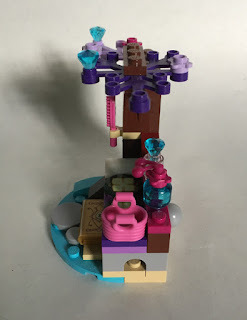 Also, like the other section of the build, the spa area is dotted with accessories—more bottles, a glass filled with a pink drink, a game board for Naida and Delphia, and assorted natural features like crystals and lilypads. 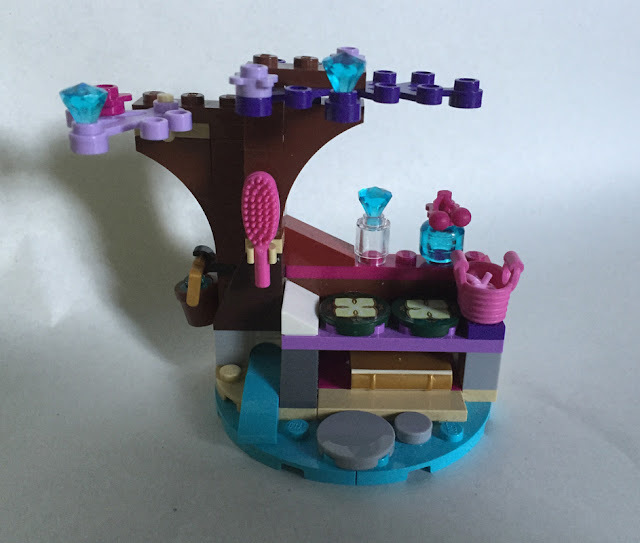 Compared to the other Elves sets, the cool colors and creature comforts of Naida’s Spa Secret create an atmosphere of rest and relaxation. 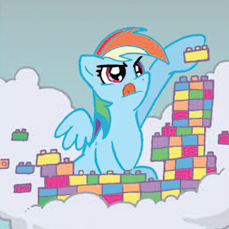 Indeed, apart from the bakery, this is the set I’ve seen criticized most for its perceived “girliness”. But I think most adults would understand that after a long day of activity, sometimes a relaxing bath or spa treatment can be just what the doctor ordered. And the fact that the set contains a less adventure-driven play scenario than the other sets doesn’t make it boring by any stretch of the imagination. 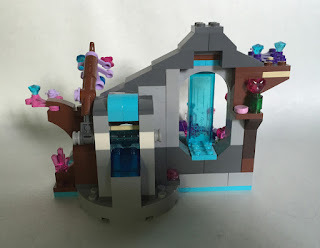 This set is a fantastic mid-sized build with an excellent selection of parts that no Elves or general fantasy fan should be without. Our thanks to the LEGO Community & Events Engagement Team for providing these sets. Consider using our affiliate links to buy them (or anything); this helps support New Elementary! 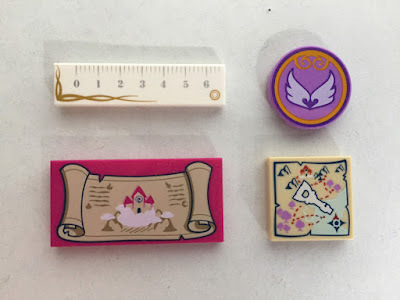 Is the 1x4 ruler tile designed to measure LEGO Modules? Can you elaborate on what a pre-pack is? I wasn't able to find a definition on google, and haven't heard that phrase before.